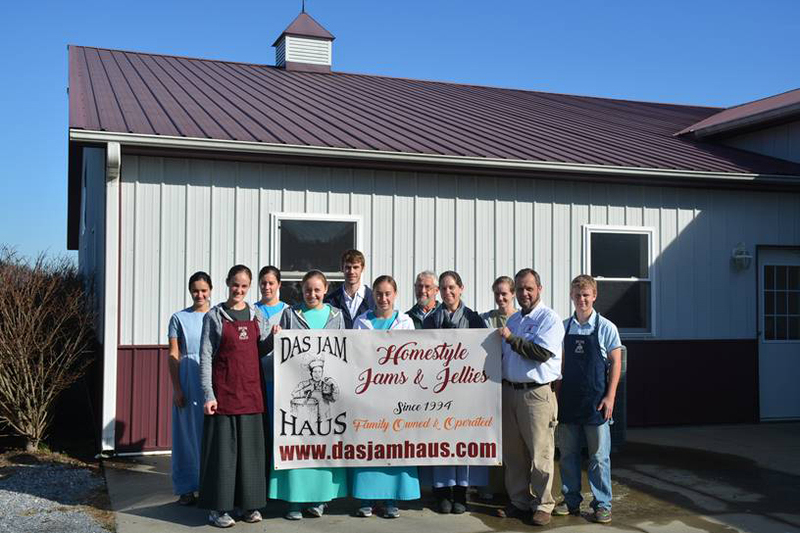 Das Jam Haus was established in 1994 by Raymond & Lana Fisher as a small home based business. Initially we offered 7 flavors of delicious homemade jam. In the years that followed we continued to expand, improving on these varieties and testing new ones. With the help of God the operation expanded and outgrew the small facilities we started with. Despite this growth we still cook our jams today just as we did in 1994, small batches in open kettles. In this way we are able to retain color & taste along with chunks of fruit in the jam. We use no artificial coloring or flavoring whatsoever. Today we are in our 3rd building and presently offer over 40 flavors of fruit jams, jellies and fruit butter spreads. Many of these are available in sugar free. We also sell a variety of honey, relishes, chow chow, salsa, pickled products, sorghum, BBQ sauces made by other Mennonite businesses. In addition we wholesale different sizes of canning jars which we can ship nationwide by the case or by the pallet. Our aim is to provide good natural homemade products at a price that is reasonable and fair. Even more importantly the Lord has blessed our family with growth and health. Presently we have 5 children, 2 of whom are married; Ryan & Jenny, Donny & Leanna, Bradley, Colleen, & Rayanna. We are also part of the Greene County Mennonite Church, Chuckey, TN, which emphasizes the importance of a personal relationship with Jesus Christ validated by a conservative lifestyle based on the principles of the New Testament. We welcome enquiries concerning our beliefs and can send literature on the Anabaptist faith upon request, free of charge. We hope you enjoy our products and that we will hear from you soon. If for any reason you are not completely satisfied with any of our products, please contact us via email or by calling (423) 257-3460, and we will be happy to assist you with a replacement or a refund.